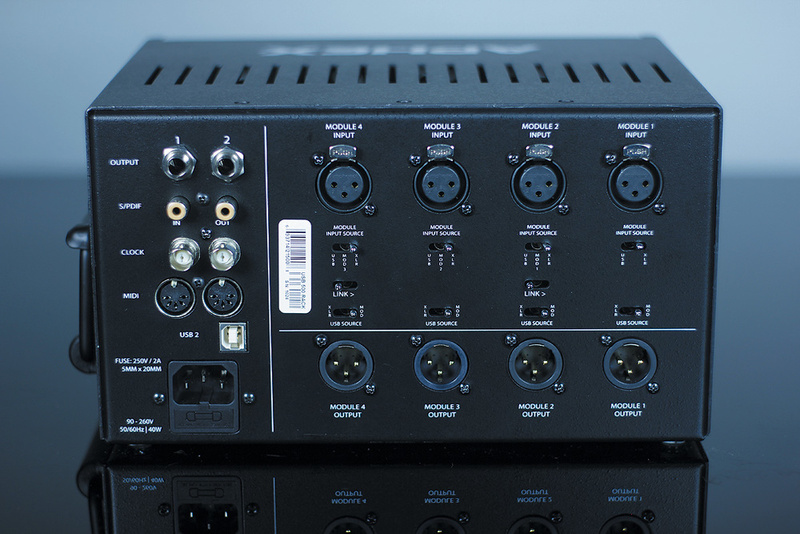 Is the combination of audio interface and 500-series chassis the ideal solution for a compact, hybrid setup? External hardware can sound wonderful and the growing popularity of the 500-series modules makes it possible to cram lots of quality hardware into a relatively small space. However, unless you're simply recording through the hardware, the hassle and mess of cables required to connect up to a largely in-the-box (ITB) DAW system can seem off-putting to anyone who's grown up using ITB systems, or anyone who is simply trying to keep things compact. Aphex decided to do something about that, and the result is their USB 500 Rack. They've also created their own range of 500-series modules, which draw on the circuitry used in some of their popular rackmount products. The USB 500 Rack is, at heart, a six-input (four analogue, two digital), 10-output (again, two digital, the others analogue) USB 2 audio interface, capable of operating at 24-bit word lengths and at sample rates of up to 96kHz. Where it departs from traditional interfaces is that it doubles up as a 500-series chassis, which provides power and audio I/O for any standard 500-series modules. They've also built in enough flexibility to easily use the hardware modules as insert effects in your DAW software when mixing. The rear panel plays host to a number of features. 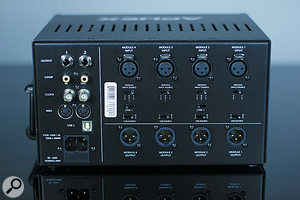 The left-most section of the rear panel houses the main audio interface I/O, including the main stereo analogue output on TRS jack sockets, MIDI, word clock and stereo S/PDIF I/O, and the USB port for connection to a computer. The right area features balanced XLR inputs for each of the 500-series module slots. These double up as audio interface I/O and are joined by a series of routing switches, enabling you to configure the device's channel path as desired.With a total case width of six 500-series slots, the USB/Monitor section takes up the right-most two module widths and houses a power button, two headphone amps (based on Aphex's Headpod 4) with independent level controls, a main volume control and buttons for Mono and Dim, the latter dropping the two main output jack levels by 20dB. Both headphone amps receive the same stereo signal from the DAW. The remainder of the front is taken up by the 500-series module slots, which can accommodate four single-width modules, but can also cater for double-width modules. 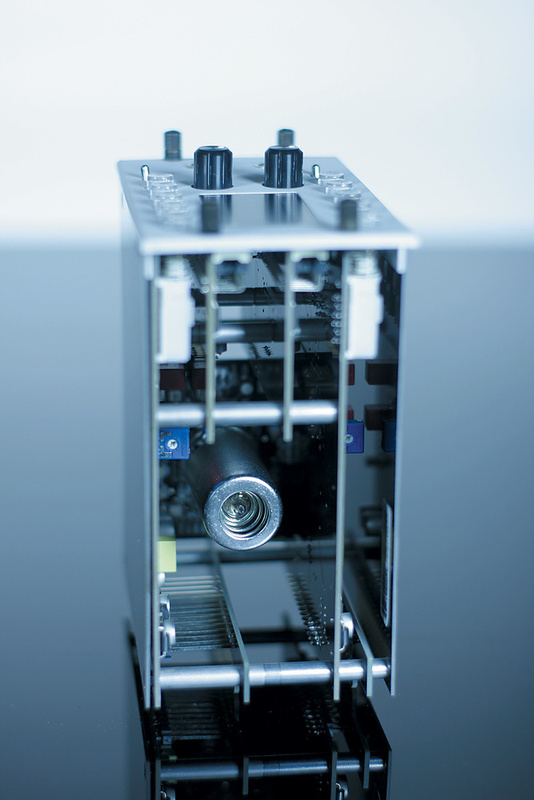 The chassis makes available 880mA of current, to be shared amongst the four slots. The rear-panel features XLR inputs and XLR outputs for the four slots, and these double up to provide analogue +4dBu line-level I/O (more on this and other routing options later). At the back of the monitor section there are TRS jacks for the main stereo output, stereo S/PDIF in and out on RCA phonos, Clock In and Out on BNCs, MIDI In and Out on five-pin DINs and a single USB 2 port. Mains power is delivered via an IEC socket, and there's a front-panel power switch. No special driver software is needed to work with Apple OS (10.5 onwards), but dedicated drivers are required for Windows (XP 32-bit and Vista 32- or 64-bit and later OS). A CD-ROM comes with the rack and includes drivers, but it's better to visit the Aphex web site to make sure you have the latest version. You may also find firmware updates for the unit there. The key to the USB 500 system is its routing capability. Rear-panel routing switches allow the user to configure the audio path through the modules as required and, usefully, this includes a stereo-linking facility as well as serial chaining. To take advantage of the stereo linking, the modules themselves must support that facility — one that does is Aphex's Comp 500 compressor, but there are several third-party modules that do, also. Each module slot has an input-source selector for the module itself, and another for the USB source. Slot one has a two-way input source switch, allowing you to choose between a signal sent from the computer via USB and the slot's own XLR input socket. The remaining three slots use a three-way input selector, the choice being between USB, XLR and MOD. The first two are the same as for slot one, but the last, MOD, routes the previous module slot's output signal to this slot's input. The USB source selector determines what signal is sent via USB to the inputs of your DAW, and it can be set either to MOD or XLR. When set to MOD, the output of the module is sent to the DAW, but when set to XLR whatever signal is present at the XLR input goes directly to the DAW — in other words, that turns the slot's XLR input into a standard analogue line-level input, as you'd find on a more typical audio interface. Slots two and four include an additional switch which caters for the stereo-linking facility I mentioned earlier. Engaging either switch links the respective module to the module in the previous slot. 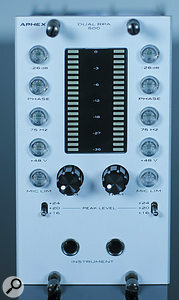 The Dual RPA 500 — the only module under review whose front panel is not visible on the main picture — is a two-channel mic preamp based on Aphex's 207 stereo preamp, and employs a system patented by Aphex to run tubes at lower than typical voltages without the artifacts usually associated with 'starved plate' designs.The beauty of this system is that all this routing works with or without the USB connected (with the obvious proviso that the USB choices don't work when the USB option isn't active!). This means that whether or not you're using the rack with a computer, it's really easy to set up stereo linking or module chaining without having to use any external patch cables. Used with a computer, you could easily fit four mic preamp modules and record microphones to four DAW tracks at the same time. Alternatively you could chain two or more modules to create a channel strip and record through those. Note that the manual warns that if there is an installed mic pre module, its phantom power should be turned off prior to switching the source to XLR so as to avoid passing the phantom power on to anywhere it doesn't belong. When mixing, the USB 500 Rack can be used to insert your choice of hardware modules into the DAW's mixer signal path, again with full flexibility; you can choose to insert one module each on four different DAW tracks or you can insert chains of modules into fewer tracks. There's also the option of using stereo-linked devices to process a final mix, submix or to use for mastering. Note that the way in which you insert the modules depends on the DAW software you are using — there's no dedicated Aphex plug-in (which might have been a useful addition for those DAWs that are less well equipped in this regard). So, in Logic, for example, I had to use the in-built I/O plug-in. There are similar facilities in most DAWs now, and they'll be able to compensate for any round-trip latency (which wasn't noticeably high, by the way). If you're a Pro Tools user, things are marginally less straightforward, but there's a very easy workaround detailed in the manual, which essentially involves creating an aux track to receive the signal back from the module. I found Aphex's USB 500 system extremely easy to use. Using Logic Pro on a Mac, the USB 500 was recognised instantly, and once selected as the current interface, its inputs, outputs and MIDI ports not only showed up straightaway but the I/O were also fully labelled when using Logic's I/O plug-in. Working this way, with the Aphex Comp 500 compressor as my first test subject, I was able to deploy it exactly as I would a plug-in. I tried processing vocals, the bass guitar track and a full mix. This simply entailed setting the module source switch to USB and the USB source switch to Module. 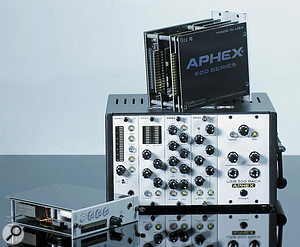 As well as the USB 500 Rack itself, Aphex supplied several modules for us to test. All the Aphex 500-series modules have a high output drive capability (typically +26dB) and are very quiet in operation with no perceptible distortion unless deliberately induced. They can be used in any 500-series rack, not just the USB 500 Rack. We've covered the EX BB500 Aural Exciter before (http://sosm.ag/aphex-exbb500) so I won't dwell on that, other than to confirm that it works in the same way as its full-size counterparts, but it's worth exploring the others in a little more detail. The different preamps employ different audio input transformers, helping to create a subtly different sonic 'flavour'. 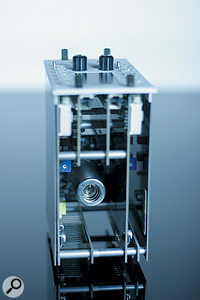 In the A Pre (pictured) you can see the Cinemag in put transformer, which is accompanied by a Jensen output transformer. If you need a front end that imparts a little character, the J Pre 500 is worth a look. Its circuitry and general sound owes much to the rather more costly Aphex 1788A remote-control preamp. It uses a Jensen JT11K8 nickel input transformer that warms up the sound in a subtle, musical way when 'pushed', and there's a further Jensen transformer on the output. The preamp provides a maximum gain of 65dB, and features a 26dB pad, polarity reverse, a 75Hz high-pass filter, switchable phantom power and a 20-segment LED meter (a switch selects +16, +20 or +24 dBu output levels for a meter reading of 0VU). Aphex have included a switchable limiter for input overload protection. The preamp can also double as an instrument preamp with a high-impedance jack input on the front panel, this taking precedence over the chassis's XLR input when connected. In use, this is a clean and natural-sounding preamp, with just a hint of flattery courtesy of the transformers, which prevent the sound from ever becoming too clinical. The limiter is very clever too as it safeguards against potential overloads caused by 'louder when the red light is on' syndrome and sounds very transparent unless it's deliberately abused. The A Pre 500 looks very similar but omits the limiter. Again it offers a 26dB pad, polarity reverse, 75Hz low-cut filter, phantom power and a 20-segment LED level meter. This time, though, the input transformer is made by Cinemag (based on the one used in the Aphex 188 eight-channel preamp), and it's designed for optimum transparency. The output transformer is once again by Jensen. A high-impedance instrument jack is located on the front panel, there's that three-way switch for selecting +16, +20 or +24 dBu output levels and, as with the J Pre 500, there's up to 65dB of gain on tap. Though a theoretically perfect mic has no sound of its own, most are chosen for their character, which strictly speaking is the result of a benign departure from theoretical perfection. While the choice of transformers in the J Pre 500 imparted a subtle warmth, I found that the A Pre 500 had more of a transparent and airy character that worked well on instruments that require good transient definition — picked strings, piano and percussion, for example. The third and final preamp in the range is the Dual RPA 500, a dual-width, dual-channel preamp that includes a dual-triode valve. RPA refers to Aphex's patented 'reflected plate amplifier' circuitry that allows valves to be run at a relatively low HT voltage but still maintain the transfer characteristics of a valve run at its full operating voltage. This technology has been used successfully in several previous Aphex products, and I've always found it to work really well — there's none of that artificially squashy tonality that usually comes with a 'starved tube' circuit. This module has the same control and metering layout as the J Pre 500, as it includes the limiter, but the mic amp circuit has more in common with the Aphex Channel and 207D preamps. The input stage is transformerless, with high-speed solid-state circuitry preserving transients. The valve is used in the output section, to add a little 'warmth' and compression. Again, the tonal signature is subtle but, when compared directly against the very clean A Pre 500, the tonality seems smoother in the highs with a slight sense of compression and fullness in the mids. Perhaps the most surprising thing about the Aphex Comp 500 optical compressor is just how much gain reduction you can pile on without affecting the subjective quality of the sound. Of course, sources like bass guitar sustain for longer when heavily compressed, but they do so in a very natural-sounding way, with no obvious change in tonality and with no detriment to the transient impact of the note. Aphex have always been very good at making transparent compressors, and this one is no exception. Even the lack of a physical attack-time control doesn't seem to impart any limitations. The four knobs control the input drive, output level, ratio and release time, and are joined by buttons for bypass and for stereo linking. The optical gain element is specific to Aphex, and the output is fed through a Jensen audio transformer. Twin LED meters show the output level and the gain reduction. According to Aphex, the EQF 500 is a modern take on their EQF2 500-series EQs, which were originally designed for API's modular consoles and date back to 1976. (The original EQF1 and EQF2 modules remain sought after on the used gear market.) The new EQF 500 provides higher headroom and a clearer control layout. It's essentially a three-band sweep EQ, on which the upper and low filters may independently be switched to bell or shelving modes. Separate variable-frequency high-pass and low-pass filters are also included; the low band can be adjusted from 25Hz to 500Hz while the mid-range extends from 250Hz to 5kHz. The high section extends from 1kHz to 20kHz, all with a ±12dB gain range. The high-pass filter can be dialled in over 20Hz to 500Hz and the low-pass filter from 1kHz – 20kHz. Once again, there's a Jensen output transformer. I can understand the enduring popularity of this EQ design, as it stays clear and focused-sounding, even when you may have to use more of it than you might normally be comfortable with. Those high- and low-cut filters are really useful for 'bracketing' sounds, and I also like the way that boosting the lows never makes the sound go 'flabby' or 'woolly', as with so many EQs. I'm also a fan of switchable bell/shelving for the extreme bands. Perhaps you can't get as 'surgical' with this as you can with a fully parametric equaliser, but as a high-quality console-style EQ, the EQF 500 ticks all the right boxes. One final module, the Project 500, was not yet available at the time of review, but it's worth a quick mention as it could extend the potential of this system considerably. It's described by Aphex as a 'full channel strip in a 500-series module', and comprises a class-A mic preamp with an instrument input, phantom power, polarity invert and 75Hz high-pass filter, an optical compressor and a dual, semi-parametric EQ, which can be placed pre or post compression. Having not yet tried this, I can't comment on the quality, but the idea of four channel strips like this being built into a USB interface is an attractive one for small-scale location recording. Aphex have addressed a genuine need with their USB 500 Rack system, and they've done so very well. Functionally, in fact, the only trick I think Aphex may have missed is in not providing an extra front-panel button or two to allow one of the phones outputs to mirror the main output (as it is, they're assigned separate DAW outputs). Any other criticisms I have are inherent in the physical design of such a system: the legending is necessarily rather small, and the routing switches being around the back means that you need to keep a clear access to the rear of the unit. Aphex have chosen to print the panel legends beneath the knobs of their 500-series modules, which means that if the unit is on your desk — where, typically, you are looking down on it — those legends are often obscured by the knobs. These niggles are minor, though, and the reality is that the USB 500 system means that you can now use your 500-series modules in much the same way as you use DAW plug-ins for mixing or mastering. And, given that many modern computer systems can support multiple audio interfaces, it should be possible to use it in concert with your interface when mixing if you wish to, as long as you have a free USB port (not a hub). If you are a DAW user who also wishes to buy into the 500-series format, the USB 500 system must be the ultimate marriage of convenience. There are no other combined audio interface/500-series racks that I know of — yet. But it's a good idea, and I'm sure the bandwagon's suspension will soon be straining under considerable weight! If you already have the interface side of things covered, some 500-series chassis, including models by Radial and Cartec, offer some of the useful inter-module routing facilities. An elegant and practical solution to integrating 500-series modules into a DAW workflow. Flexible and cableless routing options. No serious cons — just the small text and its placement beneath the knobs. We see too many solutions looking for a problem, but with the USB 500, Aphex have met a real problem head on and won. USB 500 Rack £749; Exciter EX BB500 £249; J Pre £599; A Pre £499; Dual RPA £799; Comp 500 £499; EQF 500 £499; Project 500 £329. USB 500 Rack $749; Exciter EX BB500 $249; J Pre $599; A Pre $549; Dual RPA 500 $799; Comp 500 $499; EQF 500 $499; Project 500 $TBA.